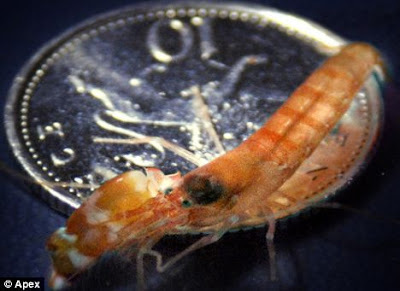 When fisherman Tim Bailey caught a pair of inch-long shrimp in the waters off Cornwall, UK, little did he know that he had made a rare discovery. While transporting the shrimp to Blue Reef Aquarium in Newquay, he kept hearing popping noises coming from the shrimps' container, as if someone were popping bubble wrap. Curator Matt Slater was able to identify the pair of shrimp as a species of pistol shrimp. It was a rare discovery, because these crustaceans are normally found in more tropical waters. But what was that popping sound? They're pistol shrimp (yet another great name for a rock band). They are able to click their claws in such a way that they can emit a 218 decibel sound: louder than a Concorde jet or a sperm whale (or, dare I say, a pistol?). They use that pistol crack to stun their prey, which normally consists of even smaller crustaceans and plankton. Once stunned (pistol whipped? ), the prey are attacked by the shrimp. The curator eventually had to separate the pair of shrimp because they kept stunning each other. Can you imagine being a dad or a mom pistol shrimp and trying to keep your kids from constantly stunning each other? Oh, the chaos. Pistol shrimp (of which there are 600 species) have been known to keep yachtsmen awake at night, as the yachtsmen try to sleep in their yachts, but can't because of all the popping going on beneath them. I feel so bad for you, Mr. Yachtsman. What with you having a fancy yacht and not being able to sleep on your fancy yacht. We each have our burdens to bear, don't we? Thanks for the article, Liz. ugh. I ain't gonna order fried shrimp for dinner tonight. When the bubbles responsible for that popping sound burst, their temperature approaches the temperature of the sun's surface. It's a phenomenon called cavitation and it's why boat propeller blades pit so rapidly. Mantis shrimp make use of cavitation as well. I'm glad they're not as big as, say, lobsters. Or dolphins. Wait, I just came up with a great idea for a horror movie! Pistol Shrimp, when snapping your fingers just doesn't cut it. I'm so glad to see that someone besides me sees rock band names all over the place. If you're seeking for MANY weirds animals, here's the place! Crustaceans most certainly can be cute! You would think that yacht owners could afford some earplugs! snapping shrimp like these are responsible for almost all of the (non-anthropogenic) noise in the ocean. It's so omnipresent that there are actually papers and papers by people studying things like whale vocalizations on how to effectively separate recordings of the animal of interest from the huge din created by the shrimp. None of the methods really even work! 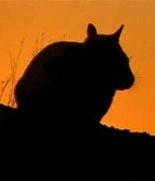 It's been proposed by some that the noise is so loud that other animal vocalizations have adapted to occupy frequency ranges where the snapping isn't so bad. Something like the "noisy Americans on the subway" of the world, I suppose! That's amazing info, Morgan. It's amazing what an impact even little creatures can have.